A lot of people think that it's strange that someone might need to learn to taste chocolate — after all, we have a lot of experience eating chocolate. And that's the issue — most chocolate is simply eaten, not tasted. Like many gourmet foods and beverages, it's possible to enjoy eating chocolate without knowing much about it. However, the more we know (about any food or beverage, actually), the more we can appreciate the nuances between different offerings. There is also a great deal of difference between eating and tasting. Tasting is a deliberate process where sensory impressions are consciously identified and compared. Eating is just, well, eating. Sort of like listening to the radio in the background. Like wine, there is a specific procedure for tasting chocolate that engages each of the senses in turn, from the way a chocolate looks to the way it smells, to the sounds it makes, to the various textures as it is chewed and then allowed to melt, and importantly, of course, the various taste impressions. The entire process is beyond the scope of this blog posting but is covered in detail in my book, Discover Chocolate, for those who wish to learn more. I can tell you that spit buckets are not normally found at chocolate tastings. 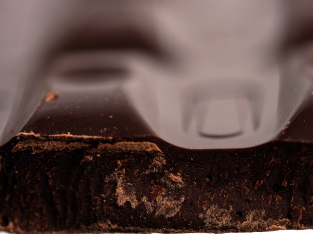 [%image "promo-image" float=left width=400 caption="Learning to taste chocolate can help you appreciate its nuances. "]The most important thing I have learned about tasting is that the vast majority of people are not supertasters and therefore feel intimidated by people who are because we (I am not a supertaster) simply don't possess the same highly sensitive sensory apparatus. This has certainly informed my approach, because I don't assume that anyone in my tasting sessions is a supertaster. Each of us has our own senses of smell and taste, both of which are modified by experience. I can do what I do because I've been doing it for more than a decade. I have learned — by tasting a lot of chocolate and tasting the same chocolates over and over again so that I remember — what specific flavors taste like in chocolate. Many people, especially when they are just starting out tasting chocolate, find it hard to specifically identify aromas and flavors in what they are tasting. With inexperienced tasters, I always start out by working with them to identify gross impressions related to overall sweetness, amount of vanilla, and chocolate flavor first. The best way to learn, I have found, is by comparison. Simply take two pieces of chocolate and compare sense impressions: this one smells sweeter than that one; that one is grittier than this one; that one has a fruitiness to it and this one tastes like brownies; this one dries my mouth out (it's astringent) on the finish and that one doesn't. If you do this with enough different chocolates, you can very quickly learn to identify — and articulate — which characteristics of chocolate you prefer. When doing serious tasting like this, I recommend clearing the palate between pairs, not between individual chocolates. Lukewarm matcha green tea (my favorite is from John Harney and Sons) is probably the best thing to use to clean the mouth. Take a nice mouthful and swish it around before swallowing (to clean all the way down the throat. Then drink a small amount of plain water. Before you know it, you'll be tasting chocolate like a pro. Please let me know some of your favorite chocolates to pair together and how they compare.